When you or your partner are unhappy about the allocation of household chores, the stress level in your home can increase tremendously. If you ask wives what their top source of stress is, quite a few will respond that it is the fact that their husbands don't want to do their share of work around the house. Stress levels increase in your home when either one of you is unhappy about unfinished chores. Couples fight over who does what around the house almost as much as they fight over money. Surveys and studies consistently point out that even though many women work outside the home, they still tend to do most of the household chores. Sharing household responsibilities helps improve marital satisfaction and household happiness. "The degree to which housework is shared is now one of the two most important predictors of a woman’s marital satisfaction," writes Stephanie Coontz in the New York Times. "And husbands benefit too, since studies show that women feel more sexually attracted to partners who pitch in." Marriage is a partnership that includes the practical business of running the household. That means keeping financial records, maintenance, shopping, planning, cleaning, cooking, child care, transportation, etc. When the practical aspects run smoothly, there is more peace and harmony. However, if friends drop in and the house is a mess, or if there are no clean clothes to wear, or it rains hard and the leaky roof wasn't fixed because of procrastination...then irritations grow, misunderstandings surface, a conflict can happen. Courtney Ronan writes that according to an MSNBC survey, respondents were asked if the chores in their households were performed by just one person or if they were shared. The results were telling: 74 percent of men said the chores were shared; 51 percent of women said chores were shared. 26 percent of men said one person did the housework; 49 percent of the women said the same. The biggest mistake you can make in your quest to have your partner do more chores around the house is to ask for help. Asking for help implies that the responsibility for the chores belongs to just you. 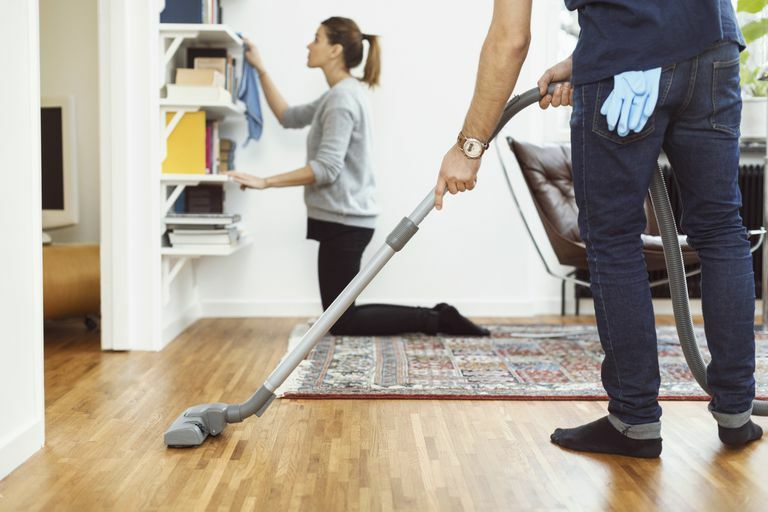 In actuality, chores around the house are shared responsibilities, and doing a good job dividing up the housework is essential to ensure a happy marriage. Here are some tips for dividing them fairly. Set your priorities as a couple. What is truly important to each of you? Many couples find they look at the division of chores differently. Domestic disorder simply doesn't bother some people. But if you are comfortable with a messy home and it bothers your spouse, you both need to compromise. Compromise works best if you select priorities, rather than trying to completely satisfy both partners. Discuss how you both feel about home cooked meals versus quick meals or eating out now and then. Find out your own and each other's feelings about dust, a clean toilet, an unmade bed, a perfectly manicured lawn, paying bills on time and so forth. If one of you feels that a toilet is dirty after two or three days, then you need to share that information so you can understand what you each feel is important. Sit down together and make a list of the chores that each of you absolutely hates to do. What one hates, the other may be able to tolerate. If both of you detest the same chore, then figure out a way to compromise in getting this particular unpleasant task done. Or perhaps you could tackle the horrid chore together, as a team. It is important, too, to be considerate of one another's body clocks. Some folks are morning people and some folks are night owls. Forcing one another to do a project or chore when they really aren't ready to do it only creates tension. Timing is important. Let one another know what the coming week is going to be like. Meetings, errands, special occasions, etc. Then decide who is going to do what, make a list, and post the list. Then let it go. Don't nag each other about what you volunteered to do. If the task hasn't been done by the following week when you next sit down to share expectations, that's the time to bring it up. If one of you doesn't follow through on promises to do your share of the work around your home, try and discover together why there is such reluctance. Sometimes one partner overcommits or underestimates the time it could take to get something done. Blaming your partner for what hasn't been accomplished or finished will not be effective. Reevaluate your plan and adjust as needed. Be flexible and allow your partner to accomplish tasks in their own way. If having the towels folded a certain way is super important to you, then do it yourself. If after discussing the situation, the two of you really can't get things done, then you need to make some choices. Look at some areas of your house and yard that you may want to cut back on to save both time and money. Or try to get your home organized so it runs more efficiently. Ask yourself if some chores even have to be done on a regular basis. For instance, if mowing the lawn is taking too much time, consider sprinkling wildflower seeds out there to let nature do her thing. If you hate ironing, give the clothes away that need ironing and toss the iron. Do the windows have to always sparkle? After an examination of your standard of housekeeping, your domestic chores may become less draining emotionally and physically. If you can't or don't want to lower your standards, you can hire some outside help if your budget can handle it. It requires some organization on your part to create a list of tasks. You can hire someone to clean your bathrooms, vacuum, dust, shine windows, change bed linens, iron, mend, or take down seasonal items. This should not be viewed as help for one partner (the wife, for example) but as help for both partners. Stephanie Coontz. "The M.R.S. and the Ph.D." NYTimes.com. 2/11/2012.